Miami-based Gold Coast Air Taxi began scheduled services on October 10, 1966, operating between Miami and West Palm Beach. Flights were initially conducted with a single Piper Aztec and the fleet gradually expanded to include three Beech 18s and one Britten Norman Islander. Gold Coast was founded and owned by Frank Wilkinson, who served as the airline's president and chief pilot. 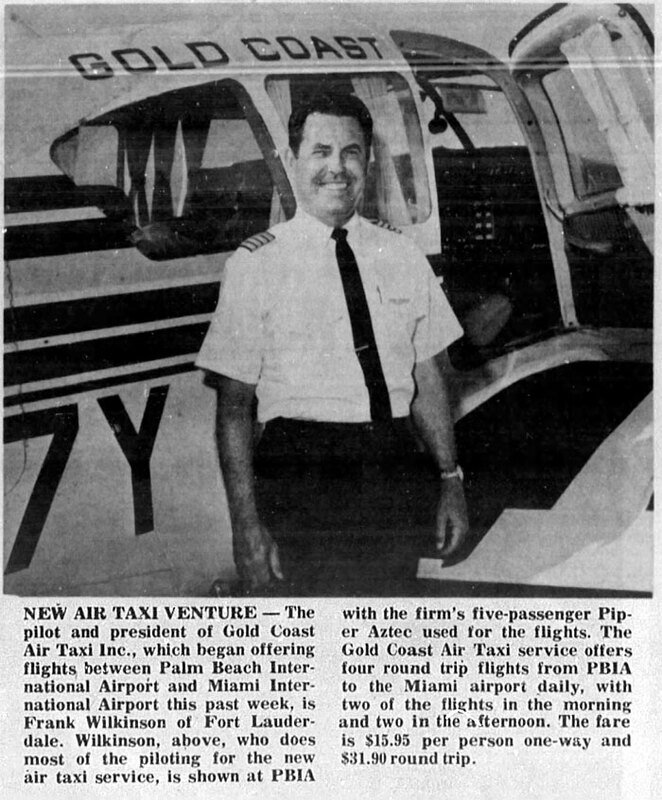 This photo of Mr. Wilkinson and Gold Coast's Piper Aztec comes from the October 16, 1966 issue of The Palm Beach Post. Gold Coast Air Taxi advertisement from the November 20, 1966 issue of The Palm Beach Post. 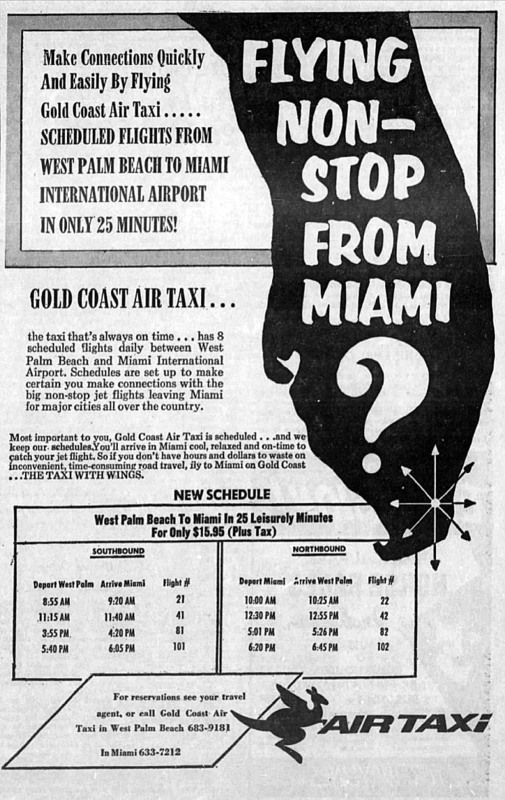 Gold Coast Air Taxi schedule effective April 30, 1967 showing as many as five southbound flights from West Palm to Miami, and oddly, six northbound flights. By November 1967, the airline had adopted the name Gold Coast Airways and was flying four daily round trips between Miami and West Palm Beach. This timetable, effective August 15, 1968, shows the addition of Boca Raton as a stop between MIA and PBI. Gold Coast was purchased by Executive Airlines for $100,000 in December 1968 and was fully integrated into the company in early 1969. Gold Coast Airways route map based on the August 15, 1968 timetable. Created with Great Circle Mapper.